This Double Dresser has the feel of an Early American antique but is Amish handcrafted for each customer. 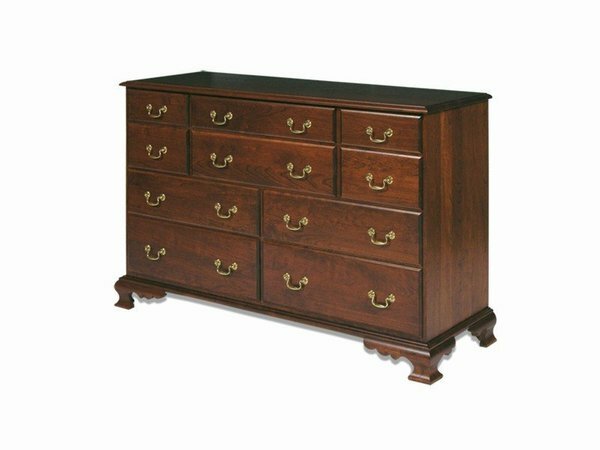 The Colonial Dresser has perfect proportions and will look great in your master or guest bedroom. Please call one of our Amish furniture specialists with questions or ordering assistance. Customize the look with the wood, finish, hardware and drawer slides. After an order is placed we send out samples to confirm your finish selection. We also can do custom stain matching if this is need. Please allow six to twelve weeks for this hardwood dresser to be handcrafted just for you! Inside Height Top Drawers: 3 3/8"
Inside Height Second and Third Drawers: 5 3/8"
Inside Height Bottom Drawers: 7 3/8"
Inside Width Larger Drawers: 24"
Inside Width Narrow Drawers: 11"